I am so proud to finally tell you more about my limited Vanessa Pur Calendar 2019. It started with a simple question and now the final result makes me so proud. In my fashion calendar I will show every month a different outfit with stockings like black tights and shiny sheers combined with my Christian Louboutin high heels or leather boots. Elegant outfits, business looks and leather outfits with overknee boots for example. These moments, when you hold on for a second and realize what happened in the last weeks and months. Mostly you just continue and work as much as possible to make your dreams come closer. But there are these moments, when you just realize how crazy and stunning it already is. One of this moment is definitely, when you see your own calendar hanging on a wall. You realize, that this year is almost over and remember all the work and thoughts, that you put in different picture productions and edits. I love to work, but it really makes my proud to see that there are some people, that loves my effort and really appreciate it. Watching my follower numbers grow feels incredible, but also a bit unreal. This brings me to the point, that matters very much to me, my supporting and loyal followers. I selected my favorite pictures for the wall calendar and ended up with 40 pictures. As this was a bit too much, I decided to let my Patrons decide which pictures they would love to hang on their wall. Some votes really surprises me, but it really helped to find the perfect pictures. For myself it is always a bit difficult to see my pictures without personal thoughts and relations. When I see my pictures, my mind goes to the situation, where the pictures where taken. What were my feelings, was it cold, who was next to me, was it a stressful time or a fun time… It is so good, that my followers helped me out. My Vanessa Pur Calendar 2019 will feature pictures of my favorite styles with stockings, elegant high heels, boots and leather. I love the final mixture of pictures and styles of my calendar. I will offer just a limited amount of calendars, as I want it to be special for the ones that will own it. Due to the size of A4, it is possible to ship the calendar worldwide. 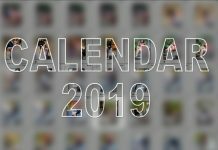 As a special “Thank you” for my Patrons at Patreon – I will offer different discounts for most of the levels and a few levels will get the calendar for free. They also get a special discount on my clothes at my Instagram profile @vanessapurstore.